I didn’t allow enough margin. I raised the kimono’s hem three centimeters. I sure wish I could sew like that. I worked all night and finished sewing three skirts. Sewn this way the stitches will come undone. 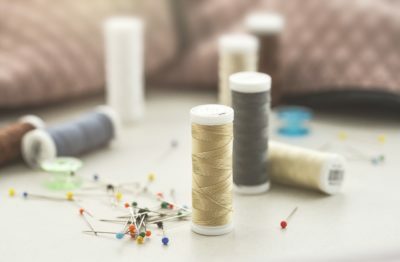 She looked for a needle and thread to sew the button. She looked up from her sewing. She’s wearing the wedding dress that she sewed herself. The old woman was bent over her sewing.